When I was in New York for Manhattan Cocktail Week, one of the most anticipated non-sponsored events was Global Rematch Beyatch. The energy was high when I got to Macao Trading Company. 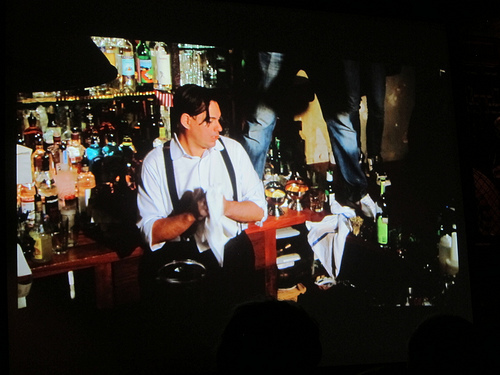 The main bar was set up for two competitors at a time. And a makeshift bar in the bar served a simple menu of essentially booze + mixer or beer. I got a Jameson on the rocks and settled back to watch the speed competition. It was time to put the jiggers away. On May 14, several countries held their own Rematch competitions. 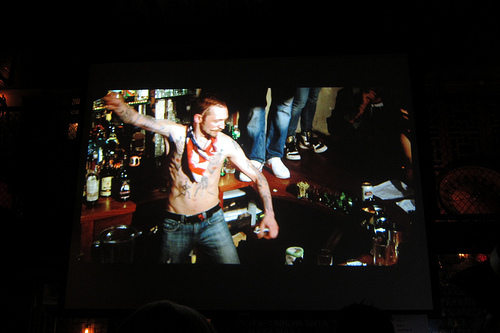 London bartender Johan Ekelund competed in both London and NYC. He hopped on a plane after his competition in the UK and flew to compete in New York. After comparing times and tallying any penalties, the overall winner of the Global Rematch is Bobby Hiddleson of London. The US winner is Steve Schneider from Employees Only and Macao Trading Company. He had an amazing time of 10 drinks in 81 seconds. Here’s the video. 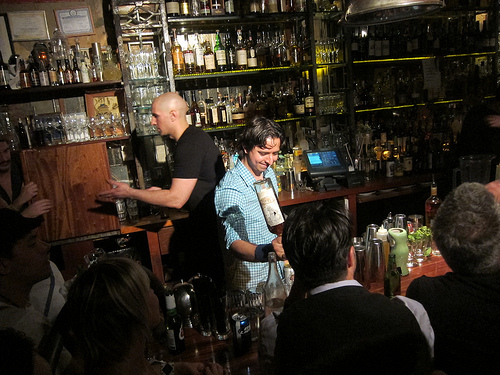 After interviewing some bartenders, I found out it was basically a good-will competition. It wasn’t sponsored by any brands and all the bartenders competing laid down $100 of their own. Then it was winner takes all. Bartenders had to make 10 drinks and the fastest took the pot. The drinks were all tropical in theme. And you had an easy one- pop the top of a beer as drink #10. From my understanding, this friendly competition has happened at least once before in New Orleans. Hence, this was the Rematch. I investigated to discover what the first match was called but no official answer so I’m just going to call it Match. It was pretty crowded at the main bar. I watched one round there but later watch the next heats on the screen. One of my favorites to watch that night was Sasha Petraske. I’ve not met him but he is legendary in the bar community having started Milk and Honey in 2000. One of the early modern bartenders interested in craft cocktails, his name is synonymous with the modern day speakeasy. The MC joked how Sasha probably hated the loud, raucous and jeering crowd. He ignored them as he set up his well. I watched him carefully wipe down every bottle before he even began. He probably spun out his drinks around 3 or 4 minutes which is incredibly fast but not fast enough to beat Steve’s score of 81 seconds. Later I saw Sasha straw test a few drinks after the judges tasted and he made such faces! Oh yes, taste does count. Now will there be a rematch for the Rematch? This entry was posted in bar stalker, bar stories, bars, bartenders, cocktail competition, cocktail week, cocktails, contest, events, history, hot bartenders, spirits, the minty, travel and tagged bartender competition, bartenders, bobby hiddleson, johan ekelund, london, macao trading company, manhattan, manhattan cocktail classic, mcc, ny, nyc, rematch, steve schneider, travel. Bookmark the permalink.